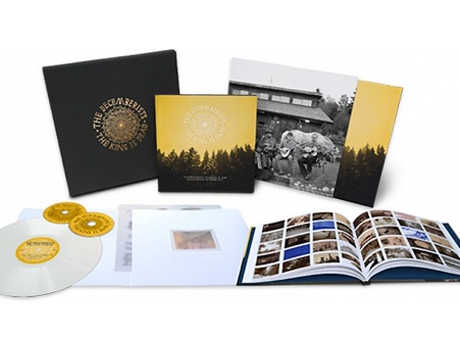 VINYL WORD: DELUXE DECEMBERISTS BOX SET CRAMMED WITH JUST ABOUT EVERYTHING EXCEPT A VIAL OF COLIN MELOY’S BLOOD; PLUS PEARL JAM AND JOSH RITTER INDIE STORE EXCLUSIVES! • One-of-a-kind Polaroid photograph by Autumn de Wilde from the Impossible Project/Decemberists series. • 72-page hardcover book featuring over 250 unique Polaroid photographs by Autumn de Wilde and illustrations by Carson Ellis. • The King Is Dead CD. • Pendarvia DVD – a 30-minute short film by Aaron Rose documenting the making of the album. • The King Is Dead on 180 gram white vinyl with special cover. • Limited edition giclée print illustrated by Carson Ellis. • Digital album download code. • Linen-wrapped, clamshell box with foil-stamped cover. Previous NEW RELEASE OF THE WEEK: THE DECEMBERISTS’ ‘THE KING IS DEAD’ – $9.99 RIGHT PRICE ONE WEEK ONLY!